A little while ago I reviewed the re-release of Coven's cult 80s masterpiece, Worship New Gods, a quirky but wonderful album that had been undeservedly overlooked. At the same time, they'd reformed and taken a second shot at their metal career with a new album, Destiny of the Gods, which I was looking forward to reviewing. Alas, over 20 years later, their abilities have rusted quite a bit, and the listener might be forgiven for wishing they'd stayed defunct rather than tarnishing their memory with this one. The band hasn't had a whole lot of new ideas since the 80s, but perhaps that doesn't matter. The heavy metal themes of Viking legend, horror and destruction, the works of JRR Tolkien, and other staples are rarely unwelcome and don't offend here either. The problem is that the band's quirkiness has decayed into a lack of focus and musical competence. Worst are David Landrum's vocals, which were always a little off-key but now have strayed far enough from the tune that they're difficult to listen to without cringing. One can detect this right away on Thor's Twins, which despite its snappy two-guitar post-punk verse riff collapses on the chorus into an off-key mess where the vocals, guitars, bass, and drums all seem to be going different directions. Winds of Revelation is also weak, an attempt at repeating the strength of their earlier doom metal sound but again poorly mixed and played, and with Landrum's vocals physically painful. I did, however, like Elfstone, a rather stock song with an old-time, proto-metal sound and ending messily but triumphantly -- Landrum's vocals still work in a weird way on this one -- and Isle of Man's quick-step riffing is short and fierce, with a guitar solo redeeming the quality of the song quite a bit. Most of the tracks, though, aren't going to make the cut. Witches Kiss has even more emphasis on the old-time heavy metal sound, sounding a bit like a Deep Purple or Rainbow track (they even include an organ), but the band doesn't have the skill to pull it off and it's pretty forgettable; and Solitary Days is a dreary mess that sounds like a high school garage band, with every member apparently focused on jamming on his own, instead of the masters that created Worship New Gods. She Rides the Dawn, though, despite being a blatant -- and I mean blatant -- rip-off of Iron Maiden's The Trooper, down to the verse rhythm and tune, still has some charm about it, partly because the original had such powerful hooks, and partially because the band is tighter and more together on this one. The last track pays tribute to a major influence on the band, Siouxsie and the Banshees, with a cover of Spellbound. This, too, has some strength not only (again) because the original song was amazing and proves its strength even in the hands of poor performers, but because Siouxsie herself didn't really know how to sing in those early years and was guessing her way through. 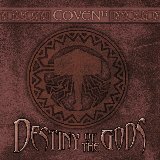 Coven won't win any prizes with Destiny of the Gods. It's disappointing and puzzling; I rather suspect that they put this together at extremely short notice to follow up on their original album's re-release on Shadow Kingdom, without having much of an idea of what they were going to do, and if that's the case, it shows. Perhaps if, now that they have reunited, they focus on tightening their sound, they might hopefully return to a point where they can charm their fans all over again.